The last time the Red Arrows were in North America was in 2008, and that was a fairly limited and short tour of the US East Coast. The last time they did a complete tour in the US was in 1993. This time, it will be a full-fledged tour, with stops in both Canada and the US. Should be very exciting for air show watchers of all the major North American air shows, once dates and locations are nailed down. Wonder what the dates will be and how it will impact the UK show circuit? They are great to watch but there will be some difference to the standard way displays are done in the US. You notice with displays that the US displays seem to be more about noise and speed whereas the European ones seem to be about keeping it tight to the field (Ukrainian displays seem to be about being slightly woolly about display guidelines. They're heading over in the back half of the year, after most/all UK shows are done. 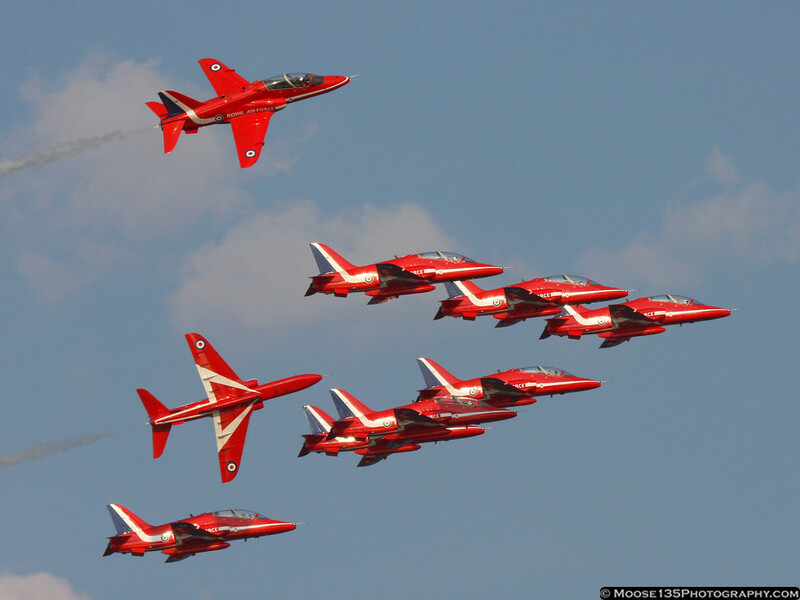 At least the headline shows (RIAT, etc thru July) will definitely get their share of the Reds. How do they compare to the US teams? Better, worse or just different? I like the Rds, the Patroille de France and the Frecce Tricolori better than the US teams— larger number of planes, slower so they closer the the field and more interesting maneuvers. The Aussies Roulettes in the prop trainer are also good for these reasons. The Blues and Tbirds have become too timid, too staged without much more than a bunch of high and low speed passes by comparison. Not taking anything away from them, just not as interesting. I would expect them to be somewhat like the RCAF Snowbirds. If you've ever seen their show, it is definitely different from the US teams, and quite good. Having one of each type at an airshow makes a good compliment. The never-changing Thunderbirds and Blue Angels get boring after 2 or 3 shows, with their endless high-speed passes, but the more aerobatic teams are always fun to watch. 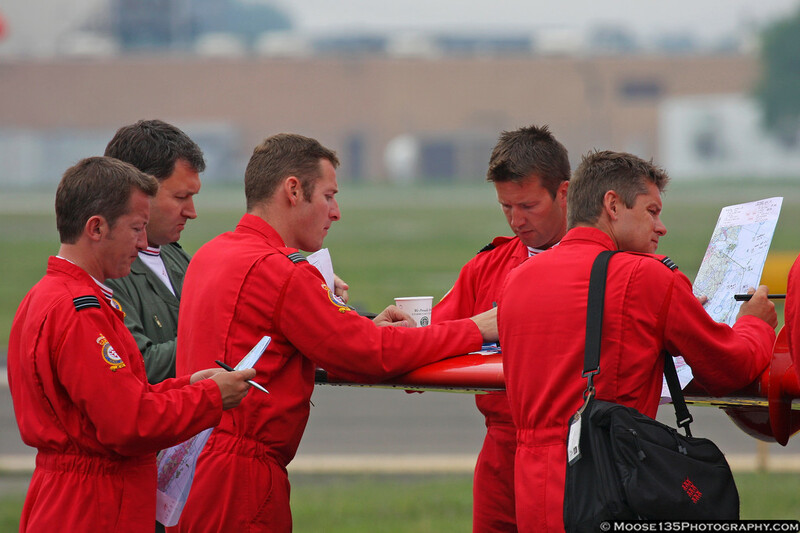 Hoping to see my first Red Arrows demo this year! I didn't get a 'Harumph' outta that guy! I got to see them when they came to the States in 2008. They did a mid-week performance over New York harbor, off Staten Island - one of the main corporate sponsors of the trip had their US headquarters in NYC, so they did a show for them. They flew into FRG (Farmingdale Republic) where I got to shoot their arrival and meet the pilots and support personnel, really a nice group of folks! I drove to Staten Island (about 40 minutes away, with late afternoon traffic) to see them in action. They had a large tent set up on a beach for guests from the sponsor company, and I was able to park myself next to the reserved area, as not many people knew about the show. For the first 10 minutes or so, they did a number of big, graceful, sweeping maneuvers with the full formation. Then it was like they said "Enough of this sh*t, let's have some fun!" They proceeded to put on the best show I've ever seen, and I've seen the Thunderbirds, Blues, Snowbirds, Patroille de France and Frecce Tricolori, and probably a couple I've forgotten. Having seen both the Red Arrows and the Thunderbirds at RIAT a few years ago, my opinion was that the Thunderbirds gave an amazing display of tight, precise formation flying and aerobatics. From a technical standpoint, it was a marvel to watch. 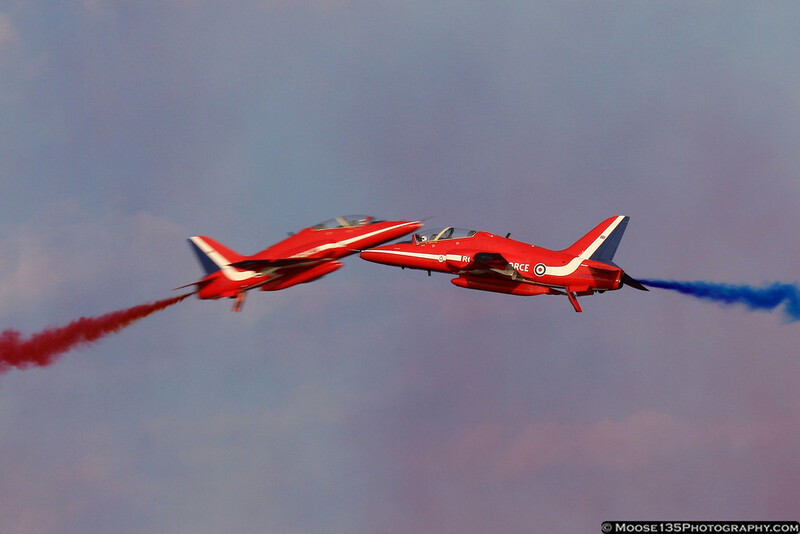 Whereas the Red Arrows were not quite so precise, but IMO their display was a lot more fun. As an aviation enthusiast, I appreciated what the Thunderbirds did. However I thought that Joe Public would have probably enjoyed the Red Arrows more. Nice pics Moose, did you shoot this video? Thanks! That's not my video, but from the looks of it, I was probably 50 feet to his right. 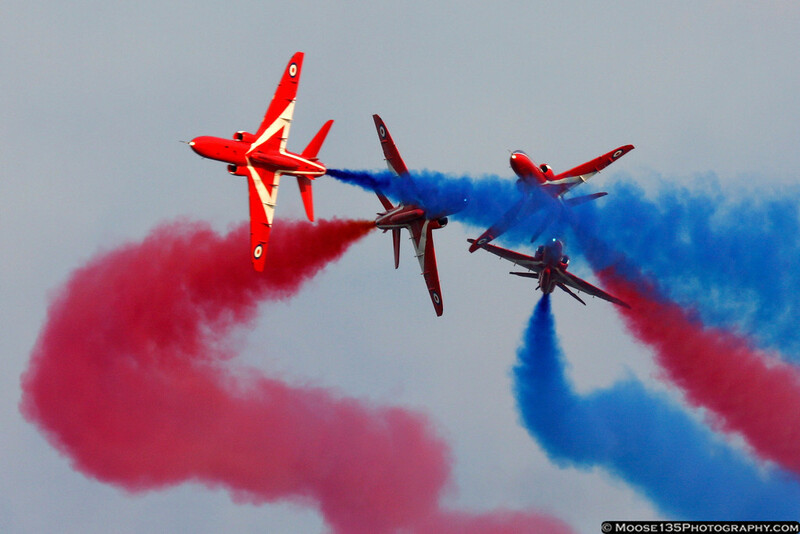 Having done my fair share of airshows, the Reds are up there in the Top 3. With the Blue Angels and, depending on how I'm feeling, either the French or the Italians. After these four, the remainder are quite a bit behind. Having seen both the Red Arrows and the Thunderbirds at RIAT a few years ago, my opinion was that the Thunderbirds gave an amazing display of tight, precise formation flying and aerobatics. From a technical standpoint, it was a marvel to watch... As an aviation enthusiast, I appreciated what the Thunderbirds did. Unfortunately I've not seen the Angels. And unless they come to the UK, I'm not likely to. Shame, as it would be great to see them. Moose - those are some great pics! I watched the Snowbirds for 5 minutes then left the airshow. I cannot watch jet aerobatic teams without afterburners. I'm sorry. I don't care for all the tight formation stuff. I want a headache when i leave, and those jet trainers cant make it happen. Do it on three, One.....THREEEEEEE! Just got the nuts hangin out. Which show is actually about skill and which just a bunch of noise? You have no idea how difficult flying nine planes in tight formation is. I didn’t mention skill and i didn’t say it wasn’t difficult. You are trying to start something where there is nothing. Thunderbirds fly tight formations and Blue Angels fly even tighter, and those parts of the show don’t interest me much. I prefer solo afterburning jet demos. I like Mach .95 passes and minimum radius turns. Nothing you say can change that. Although I did enjoy the A-10 demo I saw a few weeks ago if only for how rare that plane is for air shows. Props to the pilots in any case but just like I wouldn’t go to a electric drag race, I love noise. Top fuel or gtfo.